Gold for Maisy in Kent Schools' Championships! 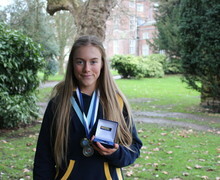 Year 11 pupil Maisy took part in the Kent School's AA Cross Country Championships this weekend, and took first place, an incredible 11 seconds ahead of the second place finisher. The county schools’ final followed a close second place finish in the prestigious Knole Run, where Maisy finished just one second behind first place, and a second place finish in the Kent County Championships. It’s the second time Maisy has held the Kent Schools’ Champion title, and this win qualifies her for the English Schools’ Championships in March.